Individual Communion wafer and juice sets are packaged and sealed for purity. Sold in 6 pack case of 500 quantity boxes: 3,000 total cups. 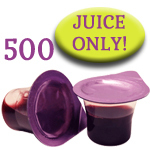 The Celebration Cup has a wafer of unleavened bread served with a small cup of juice in a convenient individual unit. Scripture is imprinted on the seal over the bread. Push up and peel back tab on the second seal under the wafer is then removed for the grape juice. 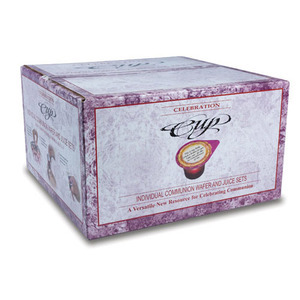 Celebration cups are designed to fit standard Communion ware. No special preparation required. Travel ready, no refrigeration necessary. 12 month shelf life from date of manufacturing. 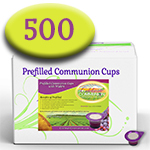 Need help choosing the right Communion cups for your congregation? Check out our Communion cup comparison chart!